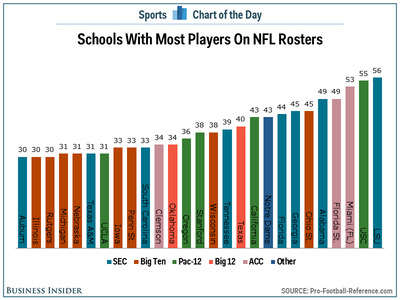 No school has more players in the NFL this year than Louisiana State University, taking over the top spot from the University of Southern California. So far this season, there have been 56 players on NFL rosters that went to LSU according to Pro-Football-Reference.com, more than any other school. USC and Miami are next with 55 and 53 players respectively. Of the 27 schools with at least 30 players in the NFL, the Big Ten leads the way with nine schools on the list, followed by the SEC with eight.